Oh I do so enjoy a challenge! Abakhan challenged me (and other creative bloggers) to spend £15 in their online supplies shop abakhan.co.uk and share the results. I went straight to the knitting section and just look what I spotted in "other": I chose the black/red floral version but there are lots of others, even animal prints! Looking at the fabric just one strip thick, it's quite translucent. However, it knits in rippling layers so that soon changes. 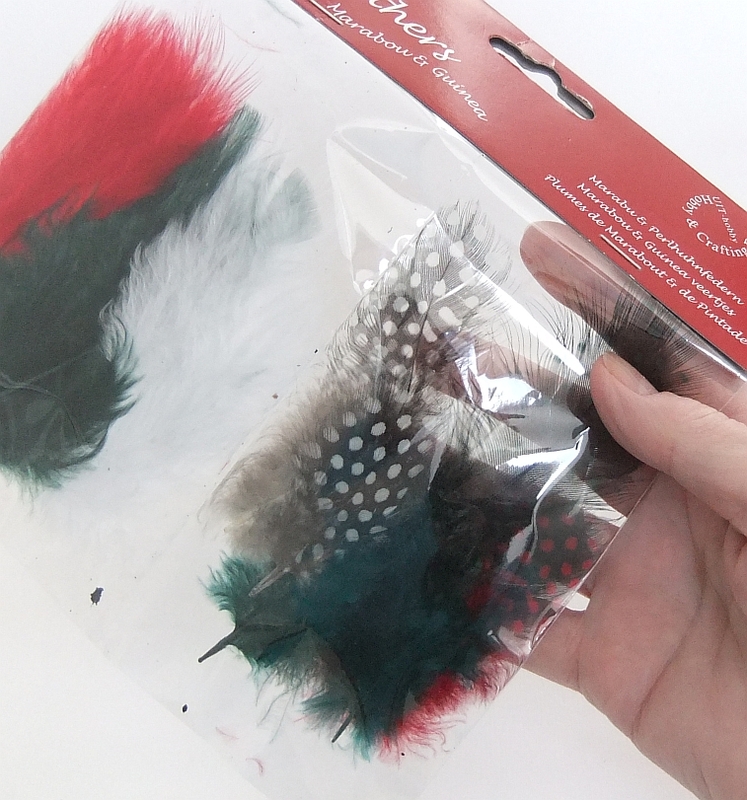 As you see, the suggestion is 4 mm - 5mm needles. I grabbed both from my stash but after starting to knit realised it doesn't actually matter. 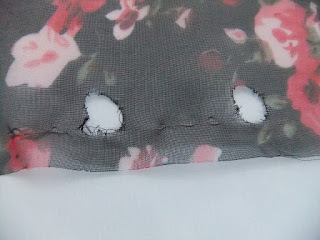 Usually a bigger needle results in bigger stitches and looser weave, but of course with this fabric yarn you're going to poke the needle into the holes in the fabric which will always be the same size. I chose to carry on with my 4mm needles because they were shorter and therefore more comfortable on so few stitches. After knitting a couple of rows I decided to switch needles again. The 4mm needles were plastic and quite sharp. I unravelled what I'd knitted so far and several of the holes were starting to fray. This is not very forgiving yarn! Best to use smooth blunt needles if you have them, and try to be sure what you're going to make from the start! 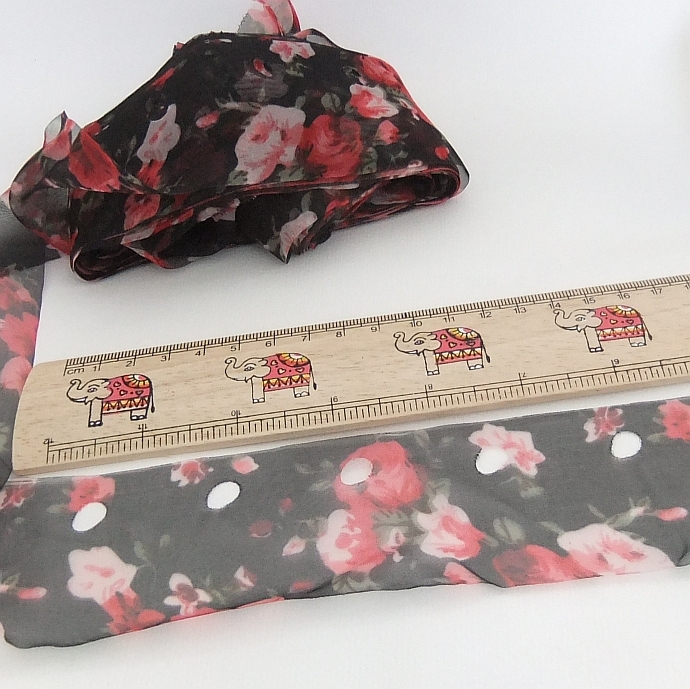 Back to work - this is going to be one VERY fancily dressed meerkat! Have you guessed what I've been making yet? Because of the season, she's dressed for Mardi Gras! I wanted her ruffled skirt to be longer at the back so I cast on 7 stitches, knitted 4 rows and then cast on another 8 and carried on to the waist. Cutting the strip at that point I joined in my normal red yarn and just picked up the stitches by knitting into the holes as before, it made a seamless join which just needed the red end sewing off. I liked the ease of changing yarn, it means you can use the fancy expensive yarn in small amounts to jazz up an otherwise plain piece. I tacked the edges of the chiffon together in a few laces to keep the meerkat's modesty but to be honest the ruffles blend in together very well. I then picked out a few feathers, tacked them together and added a wire handle so she can hold her fan - she's good to go! 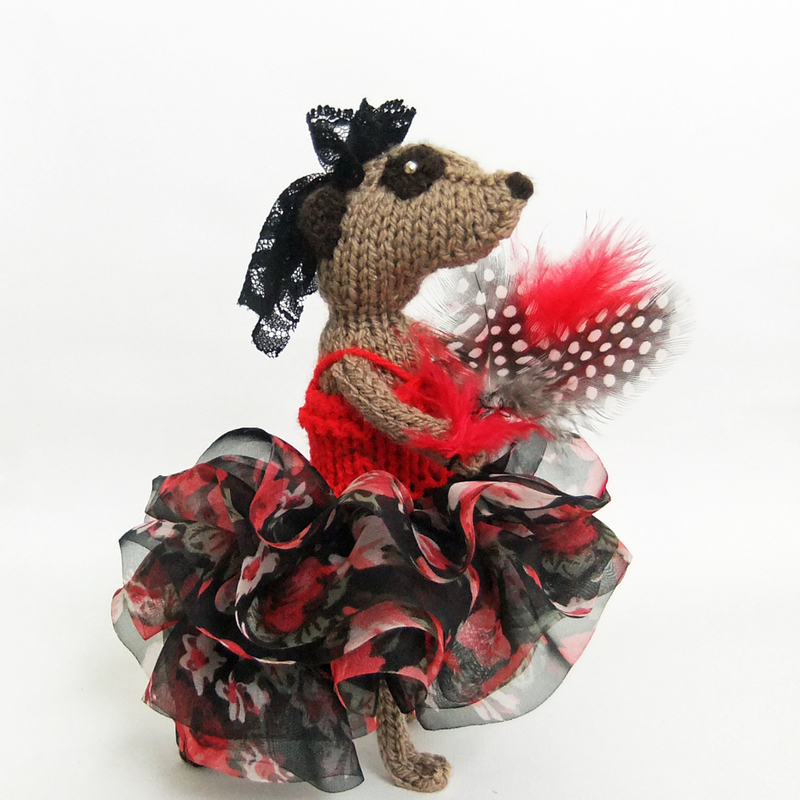 Whether for Mardi Gras or for her weekly flamenco lesson, this is one jazzed up meerkat! If you fancy becoming her dancing partner you can buy her from my Etsy shop. I still have a decent quantity of the fancy "yarn" and I'll show you the next project when I've figured out how to finish it. I'll also let you know about my third purchase from abakhan. She looks fabulous! I'm lucky enough to live close to a couple of Abakhan shops so I've seen the yarn in person, it fascinated me too, but I couldn't think what to do with it. This is a great idea!